The producers of the Broadway concert “Rocktopia” have announced that rock icon Dee Snider, lead singer of multi-platinum-selling band TWISTED SISTER, will triumphantly return to Broadway as a special guest vocalist in the show for the fourth week of its limited engagement, April 9-15. An explosive concert event that fuses the most iconic 20th-century rock with world-renowned classical masterpieces, “Rocktopia” features the works of musical innovators across centuries — including JOURNEY, Mozart, QUEEN, Beethoven, AEROSMITH, Handel, LED ZEPPELIN, Tchaikovsky, U2, HEART, Puccini, THE WHO and more — performed by an elite lineup of vocalists, a five-piece rock band, a thirty-person choir, and a twenty-piece orchestra. “Rocktopia” celebrates its opening night at the Broadway Theatre tonight, Tuesday, March 27. Tickets are now on sale at Telecharge.com. Known for his glam-rock style and larger-than-life persona, Snider became lead singer of the metal band TWISTED SISTER in 1976 and wrote the massive hits “I Wanna Rock” and “We’re Not Gonna Take It”. He returns to Broadway following his lead performance as “Dennis” in the Tony-nominated smash “Rock Of Ages”, which featured both of the above hit songs. His film acting credits include the cult horror movie classic “StrangeLand”, which he also wrote, and VH1‘s “Warning: Parental Advisory”, with Jason Priestley and Mariel Hemingway. His many television appearances include three seasons of “Celebrity Apprentice”, CMT‘s hit reality show “Gone Country” and his own A&E reality show “Growing Up Twisted”. His eclectic music career began in high school when he was selected as one of the three hundred best voices on the Easter Seaboard and made a member of the All State Choir. It has also spawned a nationally syndicated radio show “House Of Hair” which is heard on more than 200 stations in North America as it celebrates twenty years on the air; “Van Helsing’s Curse”, a concert that features a five-piece rock band, a six-piece choir, and six-piece string section; and the original musical “Dee Snider’s Rock & Roll Christmas Tale”. Snider joins “Rocktopia”‘s diverse lineup of celebrated rock, Broadway, and opera vocalists: co-creator Rob Evan (Broadway: “Les Misérables”, “Jekyll & Hyde”; TRANS-SIBERIAN ORCHESTRA); Chloe Lowery (TRANS-SIBERIAN ORCHESTRA, Chris Botti, Yanni’s Voices); Tony Vincent (“American Idiot”, “We Will Rock You”, “Rent”); Kimberly Nichole (NBC‘s “The Voice”); and Alyson Cambridge (“The Merry Widow At The Met Opera”, “Madame Butterfly”, “La Boheme”, “Show Boat”). As previously announced, Grammy Award winner Pat Monahan, lead singer of the multi-platinum-selling band TRAIN, is making his Broadway debut as the featured guest vocalist through April 8; and Rock And Roll Hall Of Famer Robin Zander, lead singer of CHEAP TRICK, will perform the final week of the run, April 23–29. 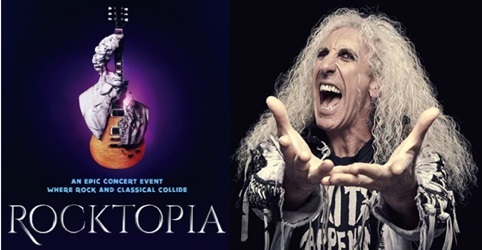 The world-class musicians featured in the “Rocktopia” band include Grammy– and Emmy Award-nominated violinist Máiréad Nesbitt (“Celtic Woman”, “Lord Of The Dance”); acclaimed guitarist Tony Bruno (MD and guitar for Enrique Iglesias and Rihanna, “America’s Got Talent”); pianist Henry Aronson (“Rock Of Ages”, THE WHO‘s “Tommy”); bass player Mat Fieldes (THE GORILLAZ, “Book Of Mormon”); and drummer Alex Alexander (David Bowie, Jimmy Cliff, Ritchie Blackmore), under the baton of “Rocktopia” co-creator Maestro Randall Craig Fleischer (San Francisco Symphony). An inaugural performance of the show, “Rocktopia: Live From Budapest”, produced by Two Hands Entertainment/Jeff Rowland, was recorded in front of a live audience in June 2016 at the 19th century Hungarian State Opera House for PBS. It was performed with the Budapest Philharmonic Orchestra with six vocalists, a five-piece rock band, the Hungarian State Opera Chorus, and the Jazz And More Choir. “Rocktopia” has since toured over 20 cities in the United States, featuring local symphonies and choirs across the country. “Rocktopia” is produced by Rocktopia Broadway LLC (William Franzblau, executive producer and Maggie Seidel-Laws, associate producer) in association with Hughes Wall LLC. Tickets are on sale via Telecharge.com. A limited number of $35 General Rush Tickets will be available for that day’s performance when the Broadway Theatre Box Office (1681 Broadway) opens each day (10 a.m. Monday-Saturday and 12 p.m. Sunday). Tickets are subject to availability. Special student pricing, beginning at $39, is available for the duration of the run. The performance schedule is Monday, Tuesday and Thursday at 7:30 p.m., Friday at 8 p.m., Saturday at 2 and 8 p.m., Sunday at 2 and 7 p.m. There is no performance on Tuesday, April 3. Performances have been added on Wednesday, March 28 at 7:30 p.m. and Wednesday, April 4 at 7:30 p.m.